Afternoon - Putting in distress(?) for 2 pounds 12 shillings and 6 pence for George Day at Henry Tippers, Charles Street - did not get any money for Landlord but settled it by drawing up an agreement for Tenant to pay Landlord 3 shillings per week i.e. 1 shilling and 6 pence towards arrears. Evening - Rindle for Rents etc. Dad is very ill - very weak. Cull sent for me this afternoon regarding Charlesworth, Dimmingsdale affairs and we had a long chat. It was arranged that I should go over to Dimmingsdale early in the morning and bring him to Cheadle if possible. Not very well today. Palpitation of heart I think; been eating too much lately. Must diet myself. Odd jobs about home and office. 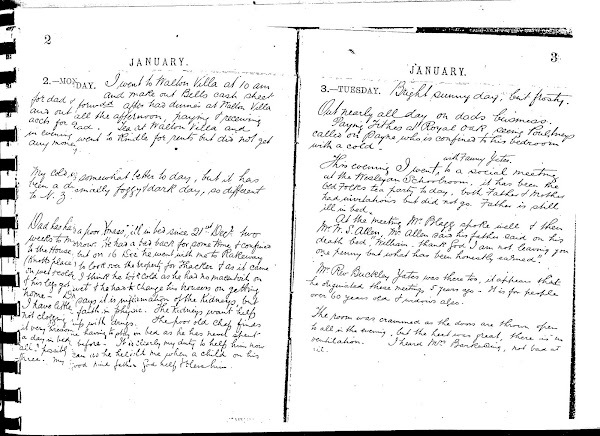 Writing out report on Cottages at Boundary for Thacker and Cull. Mr Mottram over from Waterhouses - had tea with us. Cannot settle Oakamoor valuation. Mr Lees will not have the hay at 10 tons and will not take it unless weighed. Mr Mottram says Mr Woodisse will not have it weighed so I told him then to do the best he could for his client as his decision on the part of Mr Lees was final. If I could get out my machine for testing the weight of hay and get it accurate, such disputes could not occur. Morning - Various home work and in town on Beer Business. Afternoon - To Woodhead Hall to see Mr S. Allen Esq and fixed on Thursday the 8 March for my lecture. From Woodhead Hall to Dimmingsdale via High Shut. Charlesworth away so left note that Cull wanted to see him before 5 March as case comes on then. The country is covered with snow and the East wind is piercingly cold today. Dimmingsdale would be a grand and warm spot for a poultry farm and fish culture combined. Home via Greeman Inn and Counslow Pot. Evening - Put advert regarding lecture in press. Mr Thacker called at Walton Villa and left Rakeway specification with dad with verbal instructions to proceed. So I took it up to Williams and handed it over to him. Morning - Writing out a 2nd new specification for Rakeway Farm repairs for Thacker, in place of the one they lost, and took it to Cull. Afternoon - To Boundary under instructions from Mr Cull to look over property belonging to Thorley for proposed sale. Evening - To Walton Villa. Dad, they say, is not well again. Flushed. Dr Webb has been drawing his water for the last day or two. Poor old chap. I'm afraid it's a poor case with him unless he alters soon. Morning - Walton Villa and home - odd jobs. Afternoon - With Bert to see Hazlewall Sale. Deep snow on the ground. At Sale heard Capt. Smith of Consall Hall say that Ash was out of his latitude in selling furniture. Might do for cattle. Evening - Out on Beer Business etc for dad. Received cash for dad. Morning - Walked to Oakamoor - snow on the ground 2 inches deep - to meet Mr Lees and Mr Wooddisse(?) and Mottram. Only Lees came so we could do nothing. Mr Lees says he will have the rick cut and weighed or not take it at all. The (word unrecognised) he will not pay for at all. Evening - Writing letters. Rindle to collect rents etc. Will Hodgkiss left Cheadle today per 2:30 coach from Blyth Bridge. He leaves England for America in about a month. Called on Bert Keates who has just returned from Boston, USA. He gives a poor account of the place, extreme cold, house rent 10 to 15 shillings per week. Board and lodging 28 shillings per week. Suit clothes cost 10 pounds. Out in Town on Beer Business etc. Evening to Rindle for rents. In workshop helping Chadwick with reading stand. Evening - Went through lecture sheets once more. 1) John's mother Hannah Yardley was born in Horton, near Leek, in 1818. 2) John's sister Ursula was born in 1844 in Cheadle, Staffs. She married William Yates in 1867 (Ursula's sister Sarah Ann married William's brother John Yates). In 1881, John and Ursula were living at 1 Allen Street, Stoke on Trent. They had the following children: Hannah Alicia YATES, George William YATES, Ursula Elizabeth YATES, Ethel Mona YATES, Harold Alcock V YATES and Leon Yardlay YATES. To Park Head Farm, Foxt with Will Hodgkiss to measure hay ready for sale. Very dirty journey. Called at Kent's, Fox and Goose Inn, on the way home and had some tea and bread cheese. Saw Mr. Harding at Froghall and he said the lecture at Kingsley was perfect. If I had one at Whiston, he says it would pay better than Kingsley and he would come again. Home very tired about 4:30 and had tea. Evening - Mr. Smith, Cross Keys Inn, Tean, came up, so I went to Tean to make an inventory at his place for a sale. This makes 17 miles of walking today - "Not so bad for me". To Tean and Gorsty Hill on Brewery Business. Snow on the ground and very bad walking. Will Hodgkiss went with me - Home via Freehay and Rakeway. When at Tean I saw Mr Cotton the schoolmaster and he said next Thursday would suit him for the Diorama. Home and at Walton Villa running about after Beer Business, nearly all the afternoon. Evening - Making up Brewery Cash sheet etc.